ReLaunch (Android) - A Super-fast App Launcher Overlay ~ Android Forever! Developer Quote: "ReLaunch automatically categorises your apps into 9 unique categories and provides an elegant yet simple launcher that can be accessed from anywhere with a single swipe." Keep in mind that this is a launcher overlay, so you can use it with your favorite Android launcher. It simply and effectively (and attractively) gets you to your most-used apps fast! ★ Automatic App Categorisation. Using the Google Play Market all your existing apps will be categorised when ReLaunch is installed and new apps are categorised as you download them. ★ Super Fast Launcher. Access the ReLaunch launcher from anywhere by touching the left or right edge of your screen. With a single swipe move to the category and then the desired app and release to launch. ★ Manual App Categorisation. 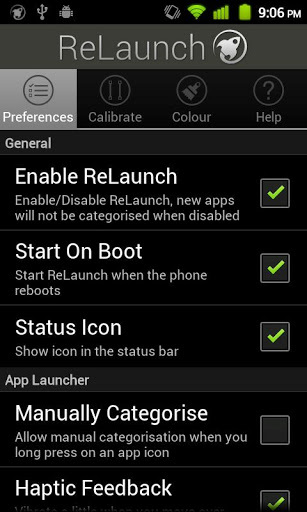 Override the automatic categorisation by long-pressing an app icon in the ReLaunch launcher and moving the icon to your preferred category. ★ ReLaunch Learns. The more apps you launch the more ReLaunch learns your favourite apps and sorts them in the launcher for even faster access. Also supports alphabetical sorting which is the default sort mode. ★ Multi-touch Support. Launch the launcher with one hand and an app with the other. Perfect for larger screen phones and tablets. ★ Calibrate. 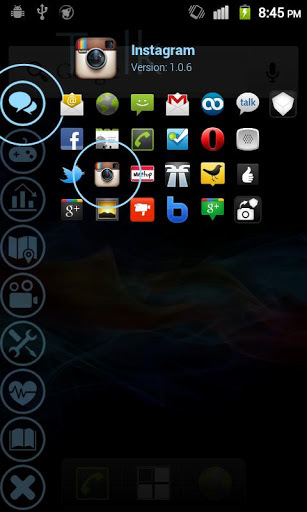 Configure the position of hotspots on the left and right hand side of your screen. ★ Personalise. 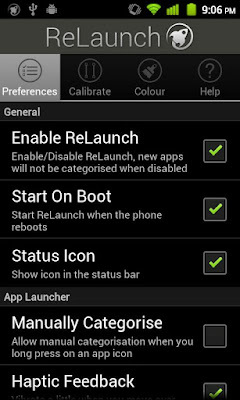 Personalise with colour the launcher categories and text.